Having a Perfecto is not anymore a sign of rebellion today; this jacket once labelled as punk and rock became a basic to have in different colors and materials. I wanted to test a Perfecto pattern on a funny fabric, so I found this little expensive gabardine which served me as a working basis. 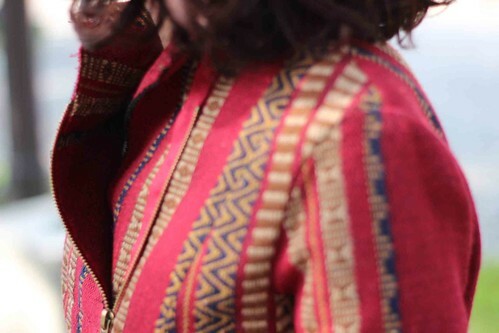 Very ethnic but not warm at all (even lined), this jacket can twist a look under a coat or a leather jacket (not a Perfecto though). When the photos have been taken, there were 15-20 °C in Paris and playing overlays did not tempt me at all. So what you have here is the mid-season look, over a white Tee to bring out the colors. I left the hems unfinished to give it a rough look. 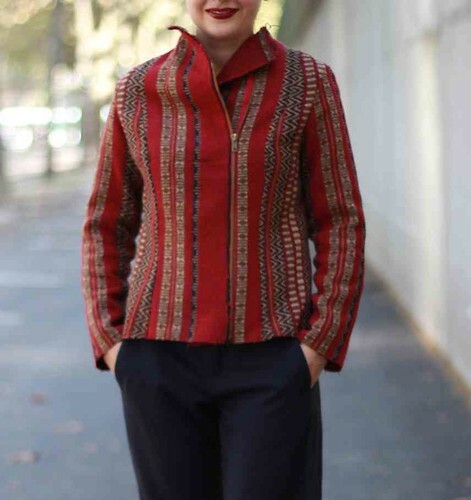 The difficulty of this jacket was matching the fabric pattern for all the pieces. And giving that I use a fitted pattern, there were plenty of seams and pieces to match. Speaking of pattern, the explanations will follow shortly after. This entry was posted in Projects and tagged jacket. Beautiful. Love how you’ve incorporated the print into the style. The colours work really well on you too. The jacket is envy worthy, your hair is gorgeous, and your lip color is perfection! Back to the jacket, the unfinished hems really keep it looking current.